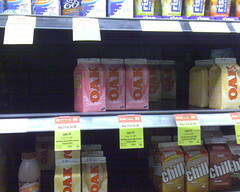 Visiting the local Coles, or many other supermarkets for that matter, I find them devoid of of Oak chocolate milk. Quite often you will find full rows of strawberry or vanilla, maybe even some iced coffee. But no Oak chocolate milk. 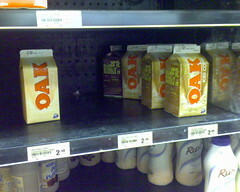 And its just the Oak chocolate milk that sells out. There will probably still be Moove chocolate milk left in the fridge. Unless people have become desperate and bought that too. And might even be some of that new Browne’s chocolate milk. Now, while I think the smaller pop top bottles of the Calci Yum variety are good for small children, the flavour isn’t quite to my taste. As you can see, the richer smoother flavour of Oak chocolate milk is my favourite. And from the looks of these shelves many other people’s too. Now, if some one could just explain this to the people that stock the supermarkets, and we might stop running out. 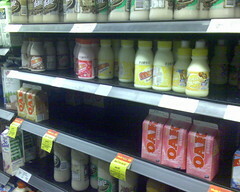 It is worth noting that both Oak and Moove are brands of Dairy Farmers. As is Dare, although they dropped the chocolate flavour from that brand. And Browne’s is a brand of Fonterra foods. This entry was posted in Photos, Shopping and tagged chocolate, chocolate milk, mil, Oak, supermarket. Bookmark the permalink.